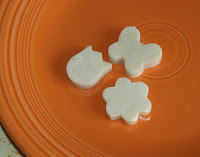 I made several different kinds of candy for my kids for Easter this year, and this recipe was both the easiest and the one they liked the most. It is very versatile and would work well for any holiday or special occasion, or simply a fun treat. This is also a great recipe to have the kids help with. The recipe comes from Julie Mathews' workbook entitled "Cooking to Heal", that accompanies her book "Nourishing Hope for Autism". This book gives a wonderful overview of the various diet options used to treat Autism Spectrum Disorders, as well as much more detailed and advanced information for those who have been doing special diets for awhile. I highly recommend her book. Put the coconut butter into a food processor (it will be chunky), and pulse briefly to break the chunks into smaller pieces. Heat the coconut oil just enough to melt and add it to the food processor while on. Add the honey and extract, and any coloring that you are using. Taste and adjust flavors if needed. Pour the mixture out onto waxed paper and place another sheet of waxed paper on top. Roll with a rolling pin to flatten to anywhere between 1/4 and 3/4 inch, depending on preference. Place the flattened mixture in the fridge to cool and harden. The recipe suggests taking it out and cutting it into squares at this point. This would work fine, but I personally feel that the candy is somewhat plain and would benefit from a little extra attention. I used mini cookie cutters to cut it into Easter-themed shapes. I also added the option of natural food coloring as that would also make it look much more appealing. Depending on the flavors, colors and shapes used, this recipe would adapt easily to any holiday. The texture of this candy is very similar to chocolate, and for those of you following the blog who aren't doing the GAPS diet you could add cocoa powder to this to make your own chocolate candy easily. Can you substitute the coconut butter with regular butter, I wonder? Coconut butter (and oil) tears up my gut so I never buy it, but I'm Lacto-Paleo so I have PLENTY of butter in the house, lol. The GAPS diet sounds v. similar to Lacto-Paleo, BTW. My middle child and youngest DD is PDD-NOS so I'm following along w/ great interest. I meant SWITCH CB with reg butter. Coconut butter is very hard and dense, so I don't think that regular butter would work in it's place. If you can have Cocoa butter that would probably work. Yes, I do think that GAPS is very similar to the paleo diet (don't know what lacto-paleo is), but GAPS is also more of a protocol than just a diet. I often tell people that it's like the Paleo diet because that gives many people a close enough understanding. Does all coconut bother you, or just the oil and butter? It is a very strong antifungal, which I know is why some people can't tolerate it. How are your kids doing? Is diet helping them? Regular coconut meat doesn't bother me (that I know of - never eaten that much of it) but I tried cooking w/ the oil and it was awful! Really upset my gut. I know that this is a really old thread, but since I stumbled upon it, I thought I others may as well. Anyway, I just wanted to say that if the coconut oil "tears up" your gut it's likely a herxheimer reaction b/c it's a very powerful way to kill off pathogens in the gut (and, therefore, a very efficient way to get them to release all of their toxins into your body at once). Try going slowly and build up.